In this article, I feel the need to be selfish. My experiences in marching with this group have had a profound effect on how I feel about this assignment. My hope is that those of you reading this article will be able to experience the struggle vicariously, and that you will have a greater, more profound understanding of what C.I.T.A., Rural Migrant Ministry, and other groups hope to accomplish with this march. I first heard of this march two months ago in a conversation with a colleague Keith McManus, who is also documenting the march. I thought about all the great pictures I could take and how my portfolio would benefit; I decided to cover the march. The time drew closer and I started thinking more about the monumental task of marching 180 miles to Albany. I made my preparations: purchasing film, making sure I had good shoes, and packing my clothes. The starting point was in Seneca Falls at the Women’s Rights National Park. It seems so long ago now; that nice sunny day is almost a distant memory. Now we are almost half done, we have a little over 80 miles left to march. The past four days and many, many miles have given me a chance to reflect upon this band of brothers with whom I travel. Determination is the first word that comes to mind when asked to describe this bunch. One foot in front of the other, they are not just walking towards Albany; they are walking towards justice. Some members of the group have been involved in the legislative campaign to change the laws that exclude farmworkers for the past eight years. The struggle, “la lucha” in Spanish, as been fought since the beginning of time and while these people are relative newcomers to “la lucha” its roots provide strength and a sense of justice. I have no doubt that whatever the outcome in Albany they will continue to fight for the rights of farmworkers. Jill McGee, a farmworker and marcher, is a dairy farmworker in Niagara County. Jeff, her son, who is also on the march worked 48 hours last week milking cows and doing other chores around the farm. He is only eleven years old and worked through his spring break to provide extra income to help support his family. Others on this trip: Jim Schmidt, Bill Abom, and John Solberg have dedicated their lives to improving the quality of those that work in the fields. Through their respective groups: Farmworker’s Legal Services of New York, Rural Migrant Ministry, and C.I.T.A they have come together to work as one on this journey to present a more potent and forceful voice to the state legislature. I am very new to this group, and yet I have been welcomed and never been made to feel like an outsider. They extended to me the same warmth and caring that they extend to all that fight for justice. The group has stayed up late almost every night discussing “la lucha” and all that still needs to be done. They give all they can both physically and mentally and still keep going, year after year, day after day, hour after hour, mile after mile. I am both proud and honored to be marching with them, and hope my writing will convey the sense of duty and commitment of this group. It goes far beyond the bandages on the blisters, the icy-hot on the muscles, or the nights sleeping on cold gymnasium floors. It is years in the making and will persist until there is justice and equality for all. As much as this trip is about equal justice and human rights, we are slowly discovering it is about the limits of human endurance. The first three days we traveled 20 miles plus each day, and it was taking a heavy toll on our bodies. Everybody’s feet were in bad shape, all were swollen, all had blistered, and some were discolored from walking in the cold and snow. I think Jim’s was in the worst condition. He had been pushing hard all three days and his Achilles tendons were as tight as guitar strings. Our injuries were not overly serious, but we realized that we could not sustain this pace all the way to Albany. The whole group gathered around the table on Wednesday night after dinner to deal with this issue. Two motions were put on the table. Jim offered the first. He felt it was important that every step be graced by a foot instead of a wheel. He took pride in that, and wanted to arrange a relay. Some people would walk as they felt well and others would ride and rest. The second motion was that we would arrange to start each morning at a point outside the city limits. The daily trek would be reduced to about fifteen miles. After a dialog that involved everyone, we decided on the second. So far, it has worked out well. Wednesday night we were welcomed by Betsy Maury the reverend of First United Methodist Church and offered a delicious dinner. On Thursday morning, after showers and a hearty breakfast of cheese and sausage casserole, we marched from Oneida to Utica with a less difficult pace, and it made all the difference. We could take breaks more often and for longer. The day was also more pleasant as it was twenty degrees warmer than Wednesday. I would not say we had a spring in our step, but we were not dragging our feet as we had on Wednesday. 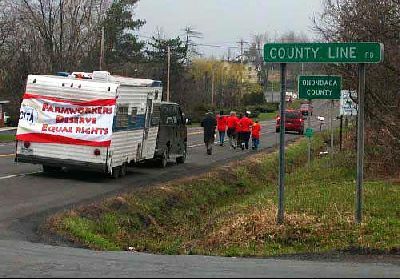 Now we are walking from Utica to Little Falls, the fifth day of our march, and things are going well. We have reached the midpoint, and right now, it seems to be the least difficult section so far. The ground is relatively flat, the sun is warm and there is a light breeze at our backs. There are six more miles to go. I hope you will all continue to follow us in our journey and keep checking Indymedia for updates on our progress. I will try to give as regular updates as possible, but finding an internet connection has not been easy.